Stephen Grover Cleveland, 1837-1908. Governor of New York, 1883-1884; 22nd President of the United States, 1885-1889; 24th President of the United States, 1893-1897. Executive Mansion card boldly signed, Grover Cleveland. This card likely dates from the first term of Cleveland, the only person ever to serve two non-consecutive terms as President. This card has the words EXECUTIVE MANSION / WASHINGTON printed at the top center, which Lynne E. Keyes and Stephen Koschal, in The History of Collecting Executive Mansion, White House, and The White House Cards, have identified as variant one, dating from Cleveland's first term. 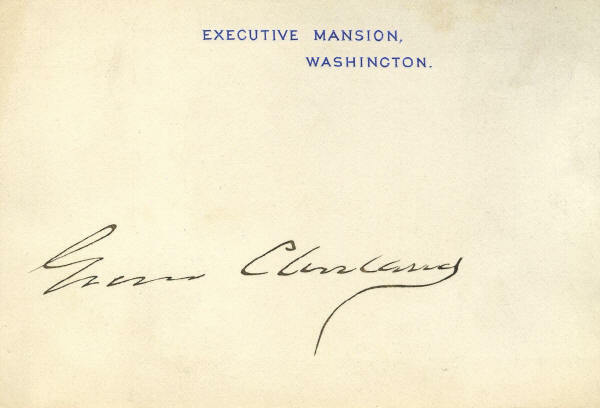 Furthermore, most of Cleveland's undated Executive Mansion cards, as this one is, were signed during his first term. This card is in very fine condition. Cleveland has boldly signed it in black.  The card has minor soiling, but it is not as noticeable as the scan suggests. 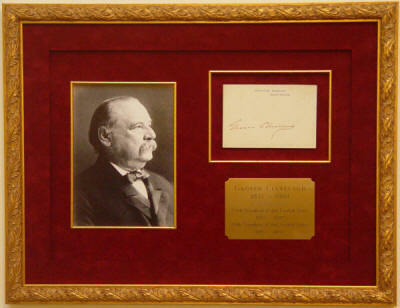 The card has been custom triple matted in burgundy suede with an inlaid gilt fillet, a portrait of Cleveland, and an engraved brass identification plate. The card is floated about the background mat, giving the piece a nice three-dimensional look. It is framed in an ornate gilt wood frame.